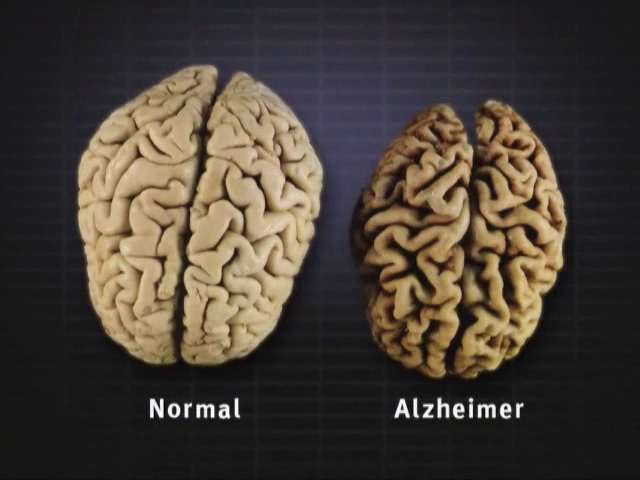 This video shows the differences between a normal brain and a brain with Alzheimer’s (time: 1 minute). Alzheimer’s disease, one of the many types of dementias, causes severe damage to the brain. Without awareness of how this disease destroys the brain, it may be difficult to understand the loss of functioning that happens to an individual as the disease progresses. Fortunately, it has been made possible to study the difference between the brain of a normal individual versus one with Alzheimer’s disease, as donations of brains, both healthy and diseased, have been given to science after the death of a loved one. When comparing the brains of two individuals (one with Alzheimer’s disease and one who did not have the disease) who lived to be the same age, are the same height and weight, as well as the same gender, there are significant differences between the two brains. The brain of an Alzheimer’s patient is considerably smaller than the brain of a healthy individual. In fact, the brain shrinks down to as little as one-third its normal size as the disease progresses. Also, when looking at a healthy brain, the folds of the brain are “juicy”, or said another way, they are very full and are closely packed together. In contrast, a brain ravished by Alzheimer’s disease has folds that are much more narrow than a normal brain, and the gaps that are between the folds are significantly wider. In addition to the physical changes that can be seen between the brain of an individual with Alzheimer’s disease and the brain of an individual without the disease, there are also chemical changes that occur. With these significant chemical and structural changes in the brain, it’s no wonder that an individual who has been diagnosed with Alzheimer’s disease loses the ability to physically function on their own, requiring assisting with dressing, eating, and grooming, loses the ability to speak and communicate, has memory loss, and lacks impulse control. Learn the differences between a normal brain and a brain with Alzheimer's including brian size, plaques and tangles.